Magnum Opus Press did a sensational job of bringing Dragon Warriors back from the veils of obscurity with a series of beautifully produced, stunningly illustrated and superbly written scenario packs, rulebooks and source material. Unfortunately, as everybody knows by now, MOP supremo James Wallis has had to move on to other projects - in particular his exciting Facebook-based sim/RPG, of which I can tell you absolutely nothing except that it is certain to become a household name as soon as it's revealed to the world. But it's not all bad news. In fact, far from it. As one door closes another - equally gilded, bejewelled, enticing and with the requisite hint of dark faerie magic - is swinging open, because a new company will be picking up the DW reins. There are some top industry names involved and you're going to like what they have planned for you. Before the new stuff starts flowing, Magnum Opus have announced the sort of offer that won't get repeated in this lifetime of the universe. They have packaged up every single one of the new edition DW releases in The Ultimate Legendary Pack, a PDF collection priced at only $88.95, which is way less than half of what all those books would cost you in their unkind-to-trees edition. Check it out over on DriveThruRPG. 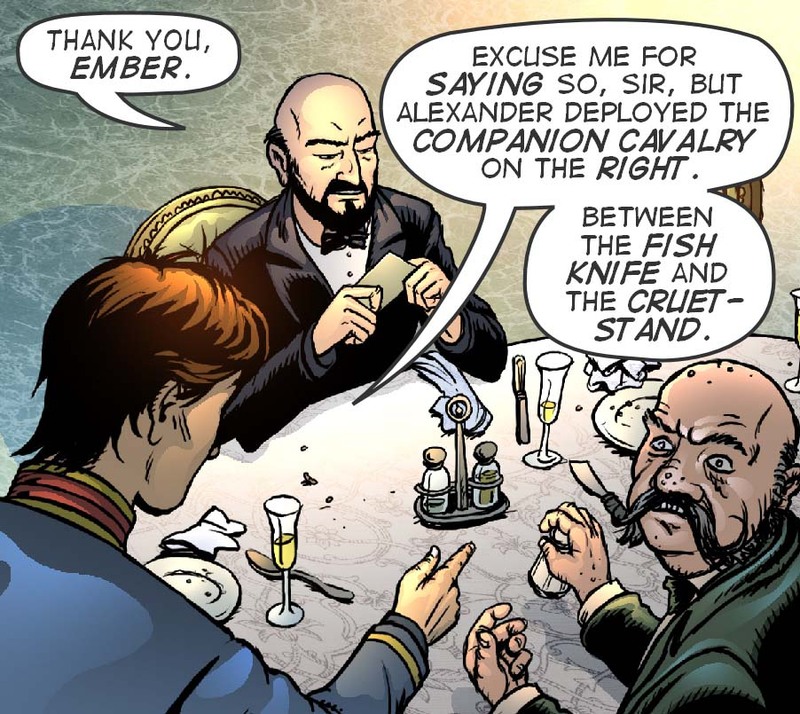 If you have an ebook reader with a decent-sized (preferably color) screen, you can grab yourself a copy of Mirabilis comic book #1 in EPUB format. It's absolutely free and you can send it to a friend. In fact, go on, we want you to - the more the merrier. And meanwhile the BookBuzzr versions of issue #1 and the first five pages of #2 are right here - just scroll down to the bottom of this page. If you look on Amazon you might find a Kindle comics version too, just do a search for "Mirabilis comics". Or read episode one online on the Mirabilis website. The Mirabilis comics iPad app is still available too, of course, but the difference with the ebook is that you get to see each panel (gloriously rendered by Leo Hartas and Nikos Koutsis) at full-page size. A veritable feast for the eyes - and you'll enjoy the story also, that's if magic-radiating comets, invading alien cabbages, bottled witches and very bad fairies are your thing. Folks who still prefer books grown with sunshine and water with will be heartened to hear that I have not become exclusively converted to ebooks and apps. Two whopping great hardcover volumes of Mirabilis (the first of eight covering the whole Year of Wonders) are due out in Britain and Ireland from publisher Print Media Productions in the spring. Measuring in at 9 inches by 12 inches, they'll be big enough to whack any size of insect pest. Don't try that with an iPad, obviously. British newspaper The Guardian (aka as the Grauniad because of its relaxed approach to proof-reading) ran a short piece about the possible resurgence of interactive fiction (aka gamebooks) on ebook readers. I like the idea, but having written dozens of sword-n-sorcery gamebooks over the years, I'd be interested to try something new. Maybe an interactive thriller, a romcom or a historical novel? I'd also chuck out the dice, percentages and stats. With paper-n-pencil gamebooks all that stuff was just there by historical accident, a hangover from D&D. In the case of e-gamebooks, the device could take care of all that so that the reader can concentrate on the story. Fabled Lands HD in the App Store now! Genius is said to be 1% inspiration and 99% perspiration, and Megara Entertainment have certainly put in the hard work necessary to create a modern gaming classic. After man-years of back-breaking and heroic labor, the Fabled Lands HD role-playing game went on sale just hours ago. All credit goes to Megara boss Mikael Louys and his chief coder, Roland Derhi, for getting this out the door - and they're already hard at work on the sequel and the iPhone version. If you have access to an iPad, check it out as soon as you can, give it five stars, and make use of the Tell a Friend button at top right. The more people who download it today, the better the chance of getting it into the Top Ten on iTunes and staying there. And that is another thing that could help ensure the Fabled Lands gamebook series continues. So help spread the word - and have fun exploring the world of Harkuna in living color! 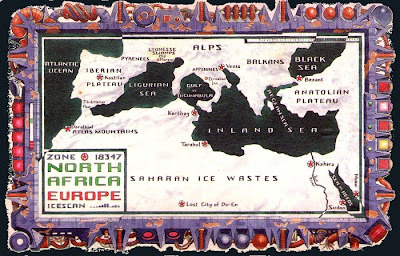 If you looked at Andrew Wright's critique of my SF gamebook Heart of Ice then you might also be interested in his mash-up of that setting with Fabled Lands structure and rules. The most recent post is the one I was waiting for: the Manta car. Oh, and camels. You could use Andrew's rules to run a role-playing game set in the Artificial Ice Age of 2300. In fact, I might do exactly that when the Fabled Lands RPG comes out. 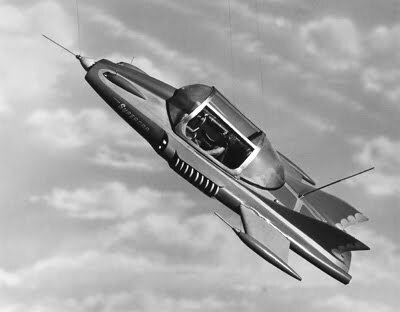 Meanwhile, I think I can explain the fascination with flying cars because Gerry Anderson's Supercar was my favorite TV show when I was four years old. Actually, it would still rate pretty high on the list. In the desk drawer beside me I have my Supercar Pilot's License, still in its clear plastic wallet, complete with cockpit drill, take-off procedure and tech specs (weight with fuel 6945 lbs). Grow up? Pah. 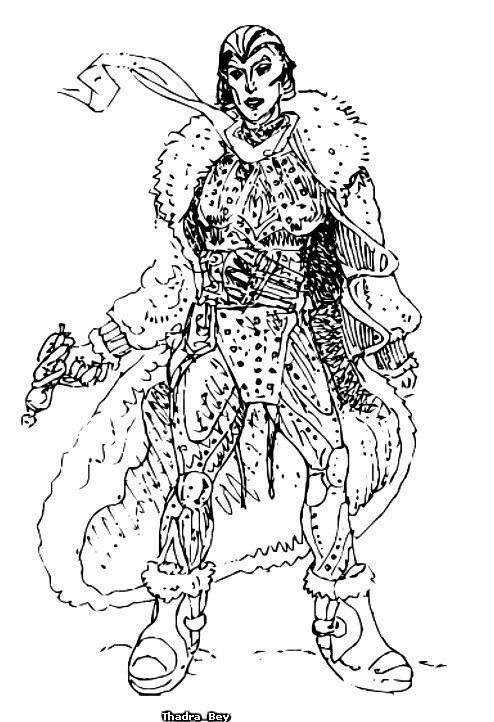 The illustration of Thadra Bey above is one of Russ's that apparently didn't appear in the original print version of Heart of Ice and was only restored when Paul Mason reformatted it for the Panurgic edition. Why, I can only guess. The original edition's art director seemed to be of the opinion that women should only be depicted in art if shaped like puddings and dressed in twenty yards of sacking. The Gargan twins picture got used only after Russ was made to change it, and this one was more of a filler so presumably it was easy to drop it. All very stupid as in neither case were the female characters in question being depicted as objects of desire liable to titillate and corrupt young minds. They were warriors like the men, and dressed functionally to do the job they came for. Nowadays, if it were a videogame or a comic book, Thadra would be swanning around the Saharan ice wastes in a midriff top and studded leather thigh boots, of course. Federico Righi has posted up a review of the reissued Fabled Lands books in Librogame's Land magazine. Alternatively check out librogame.net. And if you don't read Italian, feel free to write a review in English (or indeed any other language) and post it up somewhere on the web. We won't complain! 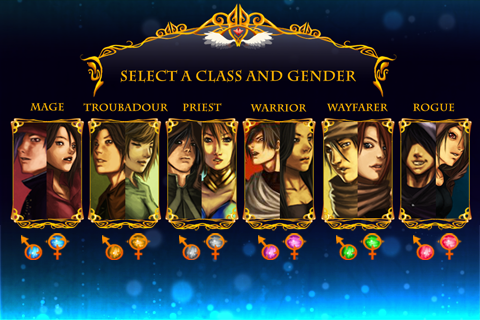 Federico is also working on a translation of "The Island of Illusions" for Italian gamers. We'll post up the link as soon as it's ready. 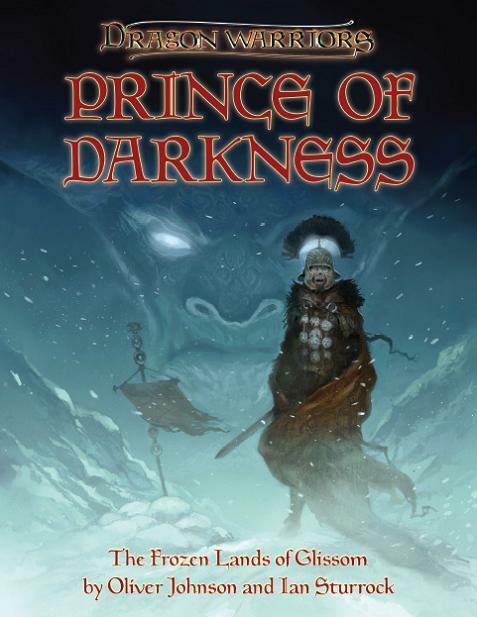 By the way, if you're looking for the Fabled Lands books, you can get them from Amazon Italy for the knockdown price of €5.05 each. That's almost 30% off what UK and US stores are charging. I call that a pretty fabulous deal. And talking of sweet deals, Barnes & Noble are giving 5% off Mirabilis at the moment. And Amazon France have it at a discount too. The whole world's gone mad. A whole other tradition of fantasy that's a hundred shires away from cursed swords and dank cobwebby tunnels and granite-toothed ogres is that particularly English kind of whimsical and often surreal collision between the magical and the commonplace. You can see it running through in a direct line of descent from Lord Dunsany to Harry Potter with a cadet branch extending off to The Goons and the Bonzo Dog Band. To my mind, fantasy is at its best when it encroaches onto our familiar world. Non-humans in taverns (whether from Middle-Earth or Aldebaran IV) are pure escapism, but magic that nudges in around the corners of everyday life has to reflect our real daily concerns. That's why, even in role-playing games with a high adventure setting, I like the conflicts and drama to arise out of believable human relationships and concerns. Sergio Leone showed that you can stage heroic, indeed mythic, adventure without having to save the damned world all the time. The greedy race for a box of old banknotes, the struggle to save one lost child, the always-doomed attempt to do the right thing - these are much more engaging than having to reunite the three lost pieces of the shield of Blah so that the evil lord Urg is sent back to the realm of So-what. Hence the project that occupies my time these days is Mirabilis, a huge comic book epic that I'm weaving with Leo Hartas (pencils and inks), Nikos Koutsis (colors) and Martin McKenna (covers and concept art). A green comet appears in the sky, heralding a year when imagination and reality combine. The magic has come back into the world - and not only magic, but everything that traditionally belongs in fiction, legend and dreams. Mirabilis is my paean to fantasy, the type of fantasy that celebrates illogic and finds a tenuous, obscure circuit through the human unconscious to locate deeper truths than words and facts can ever hope to get at. 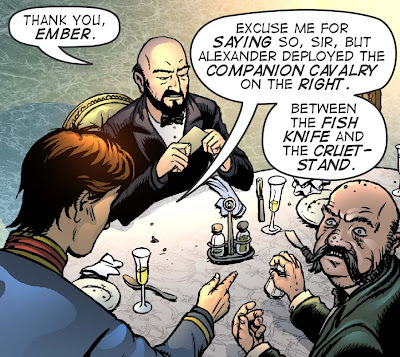 "Mirabilis [has] a nice bit of mystery, dark fantasy and a very Bryan Talbot-esque art style. Hopefully we’ll be seeing this find its way into print at some point." And indeed you will see it in print, in fact in two glorious large-format hardcover editions if you live in Britain or Ireland, as John Freeman reported in the other essential UK comics blog Down The Tubes just before Christmas. 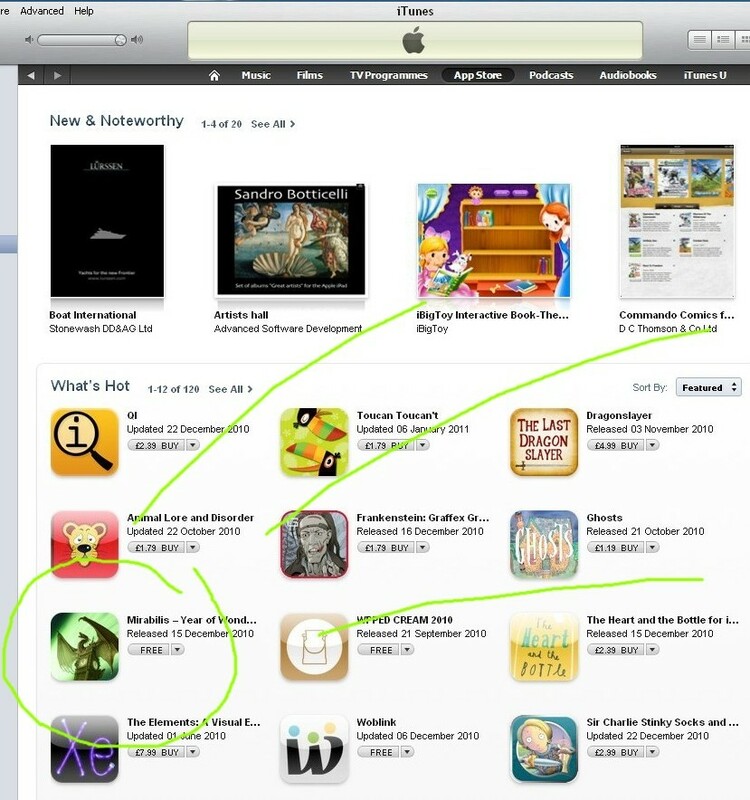 Meanwhile you can get the Mirabilis graphic novel for iPad in App Store books, where it has risen this weekend to #7 in the "What's hot" chart. If you don't have an iPad, take a look at the little book-flippy widget thing at the bottom of this very page, and if you like the first episode and you live in the USA or Canada then you can buy the American trade paperbacks by clicking on the cover images in the sidebar or going to Barnes & Noble. A quick plug today for Andrew Wright's interesting critique of my gamebook Heart of Ice, which has been running in four parts this week on his Fantasy Game Book blog. If Andrew's analysis makes you want to try the adventure for yourself, you can pick it up from the sidebar at the right, or go get it here. It's diceless and fully hyperlinked, so you don't need a pencil; you don't even need to turn the pages. Oh, and did I mention that it's free? This is something Jamie and I wrote for a series of kids' books called Legendary Sourcepacks. The idea was to present other times and cultures using techniques borrowed from role-playing games. So, for example, you could generate a Roman character and the book would present you with life choices - join the army, go into politics, train as a lawyer, and so on. And you'd get to read the background stuff to guide those choices, and at the end you'd have created a typical life history for a character from another time and place. Because the choices would be accompanied by tables, whether you rolled dice or just picked, you'd get to see the real statistics of that culture. The chance of being born an aristocrat or a peasant, and how that defined your options. Nothing came of the idea, but we did do a lot of research for the late-medieval Japan book, and that wasn't wasted because we later got to use it in Tetsubo, a Japanese(ish) supplement to Warhammer Fantasy Role-Playing. 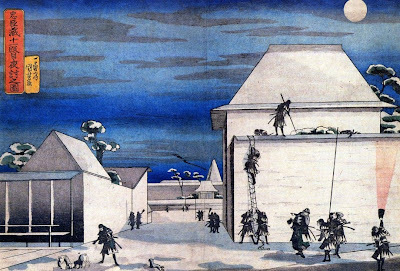 The story of the Forty-Seven Ronin took place in 1701-03 and this is how (with a good helping of poetic licence) we wrote it up for the Legendary Sourcepack. Had Tetsubo seen the light of day, I think this would have been adapted as a scenario. And btw, if you want the Tetsubo PDF (a whopping 200 pages) it's sitting right there for the taking. Honor is more important to the archetypal samurai than anything else. Certainly more important than his life. 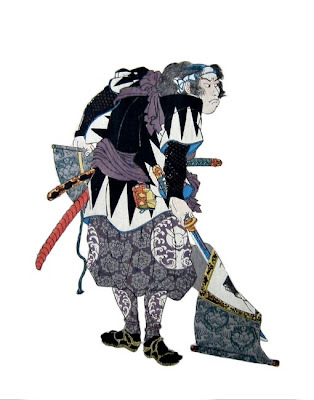 This is illustrated very well by a true story - the story of the Forty-Seven Ronin. Lord Asano was the daimyo of a very important province, but he was a country lord who had lived a life of hunting, battles and carousing with his men. He did not have much idea of courtly graces, and so when he was called to the Shogun's palace in Edo he was assigned an etiquette tutor, a man called Kotsuke-no-Suke. This Kotsuke was a pompous overweening man who hated the thought that Asano, with his unrefined warrior's ways, was his superior. Matters were not helped by the meager sums that Asano offered as payment for the tutoring. He thought they were all that a minor samurai like Kotsuke could want, but Kotsuke was used to living in luxury on the bribes he received as an official of the Shogun's court. He only found Asano's gifts insulting. He took to needling Asano whenever he could, pointing out in a sly way all of the daimyo's unrefined habits and vulgar tastes. 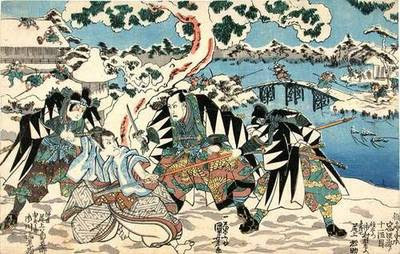 Asano had been ordered by the Shogun, who was his supreme lord, to acquire the decorum expected of an Edo noble. He tried his best to ignore Kotsuke’s taunts, but as a proud warrior he could not tolerate the continual affront to his dignity. Finally he lost his temper and, drawing his wakizashi he lunged at Kotsuke. It was only a glancing blow and Kotsuke fled in panic clutching his wounded arm. Retribution came swiftly. By drawing his shortsword to attack an official of the Shogun, Asano had committed a heinous crime. Privately the Shogun sympathized with Asano. He would not have expected a good samurai to behave any other way, but the law was still the law. He ordered Asano to perform seppuku. 1. To atone for having done something shameful. 2. To atone for failing in one's duty. 3. To preserve honor - for instance to avoid capture by the enemy when surrounded on a battlefield. performed if the lord has treated the samurai unfairly or is pursuing a policy with which he disagrees. 5. To resolve a dilemma between honor and duty. One example would be if the samurai was ordered by his lord not to take revenge against a hated foe; duty obliges him to obey the lord, honor requires him to kill the foe. 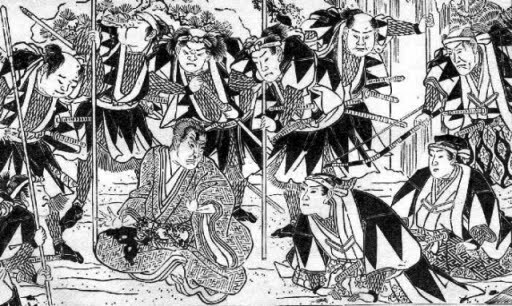 Seppuku as a way to show helpless rage at a foe is known as funshi, and it has the additional advantage of shaming the foe in question. In the Forty-Seven Ronin story, Asano could have used funshi to disgrace Kotsuke. 6. As a form of self-execution after committing a capital crime. 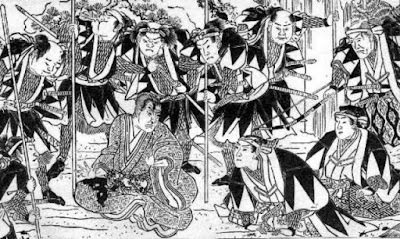 A samurai can be ordered to perform seppuku (as Asano was after his unlawful attack on Kotsuke). In effect this is the same as capital punishment except that the samurai has the right to take his own life. This right was only denied in the case of particularly heinous crimes such as treason. Asano could have fled back to his own province, but it was unthinkable for him to defy the Shogun, to whom he had taken an oath of fealty. In any case, he knew that no one could oppose the Shogun's rule and to do so could bring dire consequences for his whole family. He selected his chief retainer, Oishi, to be his second. As Oishi stood by with drawn sword, Asano knelt down and collected himself for the end. His wakizashi was beside him and his garments were loosened so that he was naked to the waist. After a few moments he took up the wakizashi and plunged it into his stomach, drawing it across and then upwards to make a V-shaped cut leading to his sternum. Then he leaned forward and, so that he would not disgrace his final moments by unseemly cries or death-throes, Oishi ended his master's agony by cutting off his head with a single blow. Afterwards Oishi called the samurai of Asano's clan together. "Our master has been brought to his end by the machinations of that unworthy wretch Kotsuke," he said. "Is it appropriate that a great lord should die while a dog like that should strut about and gloat? I do not think so! We are samurai. Our own lives are of absolutely no consequence and our sole purpose is to serve our lord. Now that he is dead we should serve him no less loyally than when he was alive. I intend to avenge our master's death, and I ask those of you who are prepared to join with me to come forward now. The rest of you may seek service with another lord or become ronin as you wish. However, I charge you by the oath you swore to our lord not to divulge to any other person this intention of ours to take revenge." to disperse for a year. Each man was to carry on a trade or live the aimless life of a ronin, so as to give Kotsuke the impression they had given up any thought of taking revenge on him. Ronin are masterless samurai. They may have been discharged from service, but more often they are samurai whose lard has had his lands confiscated by the Shogun or who has died without leaving an heir, resulting in the extinction of the clan. Generally ronin are viewed with contempt, but some achieve great fame and glory. Miyamoto Musashi, the greatest swordsman in Nihon's history, was such a one. At best a ronin can be a kind of knight-errant; at worst he is no more than a bandit. Oishi himself went to Kyoto, where he took to drinking and carousing. He divorced his wife and bought himself a concubine. His son, Chikara, was often seen roistering about the town with his father, and people were disgusted at the spectacle of two former samurai of good lineage behaving in such a way. When these reports reached Kotsuke's ears they convinced him that he had no reason to fear. He began to relax his guard, not suspecting that some of the Asano clan samurai had already infiltrated his townhouse under the guise of gardeners and servants. They were sending Oishi the information he needed to prepare an attack plan: the layout of the townhouse, the height of the walls, the strength and dependability of the guards, the times of the various watches throughout the night. At the end of the year, the forty-seven loyal retainers kept their rendezvous in Yedo. It was the very middle of winter and the whole city lay silent and still under a blanket of crisp snow. They wore robes of white and black: a jagged pattern that blended well with the thick shadows cast by moonlight on the snow. into two groups. Chikara takes twenty-three men and heads around to the back gate. 2: Four men steal into the courtyard using rope ladders and surprise the guards in the Porters' Lodge, who surrender without a fight. 3: Having discovered that the keys are kept in the main building, the ronin smash down the front gate and rush in to secure the courtyard. Simultaneously Chikara breaks into the garden. 4: Oishi posts ten men with bows on the roof of the building with orders to shoot any messengers running for help. He sends letters to the neighboring houses explaining the situation so that no samurai are sent out to interfere. 5: Oishi gives the signal for the ronin to enter the house. They are met in the hall by ten of Kotsuke's retainers and a fight ensues. 6: Chikara breaks into the house and moves through to rendezvous with his father's group. 7: Having overpowered the ten retainers without loss, Oishi and Chikara meet here in the living room. The ronin are united. More of Kotsuke's retainers arrive and a general melee breaks out. 8: Apprised of the situation, Kotsuke goes to the concealed courtyard behind his private chambers to hide. favour, sends a runner to bring help from Uyesugi, Kotsuke's father-in-law. The man is picked off by the archers stationed on the roof before he is halfway across the garden. 10: Kotsuke's three best retainers, Kobayashi, Waku and Shimidzu, emerge from the private chambers and beat the ronin back. Infuriated by the delay, Oishi sends in Chikara for a personal duel with Waku. Chikara is driven back into the garden but manages to overcome Waku in the end. The other ronin charge forward and overpower Kobayashi and Shimidzu. 11: With the house now secured, the ronin find no sign of Kotsuke in his personal chamber. They commence a search of the house from top to bottom, but to no avail. 12: Finally the ronin find a gap in the wall behind the tokonoma alcove. Yazama Jintaro enters the hidden courtyard and finds Kotsuke quailing there. He is dragged into the house and invited to perform seppuku, but refuses even now to acknowledge his guilt. Eventually Oishi executes him by stabbing him through the heart with his shortsword. His head is cut off and the ronin leave to go to Sengakuji temple. The details of the ronin's attack are given on the map of Kotsuke's house. After capturing their enemy they invited him to perform seppuku, but he lacked the courage to do so. Eventually the ronin stabbed him to death and took his head to Sengakuji temple. They were widely lauded as heroes, and the Shogun himself was said to express his admiration of their loyalty, but everyone knew that their fate was sealed. 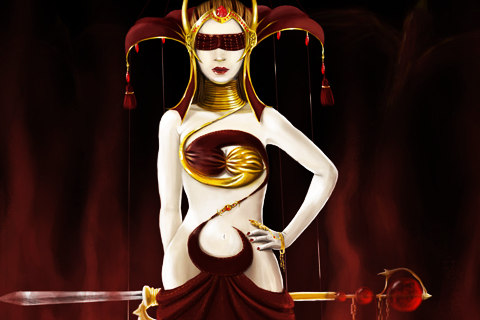 Vendettas were illegal, and within a month the ronin received the judgment they had expected. Oishi gathered them together and addressed them for the last time. "We have avenged our lord's death," he said. "This was the whole reason for our remaining in this world. Now that we have done as duty and loyalty demands, our continued existence has no purpose. We have heard the Shogun's decree; we will now join our lord." Sekishi and His Reverence Ichidon. OnAn on is an obligation or burden of shame. A samurai who acquires too great an on has no choice but to expiate it with seppuku. One night while Oishi was playing the drunken wastrel to confound Kotsuke's spies, a samurai from Satsuma province came across him lying in a drunken stupor by the roadside. Outraged, he spat on Oishi, cursing him for choosing a coward's life instead of upholding the ways of the Buke - the warrior class. A year later, upon hearing of the actions of the Forty-Seven Ronin, he felt he had incurred an unbearable on through his hasty judgment of the faithful Oishi. He went to the grave of Oishi where he performed seppuku as a sign of his contrition, and he was buried alongside the ronin.